Pudget: Losing Weight On a Budget! : Can I Really Run 3 Miles? An Awesome Giveaway!!! Today's Breakfast was my famous Pumpkin Breakfast muffins. Ok, so they aren't famous and they aren't my recipe but they are so easy to make and taste so good. Click here for the recipe. I made 24 muffins and froze the ones that we haven't eaten yet. I will get them out of the freezer the night before I want to eat them and they will be great. Especially on the days I have to get up really early to take my daughter to pre-school. I had the muffins and of course a big cup of dunkin donuts coffee that my parents bought me for Christmas. Today it was French Vanilla. It is awesome! Did I tell you they also got me a Dunkin Donuts gift card. How sweet is that? Now I don't feel guilty about going to the drive thru to get a coffee every once in a while. Plus if you register your card right now at the Dunkin Donuts web-site they will put an extra $2.00 on your card. Almost worth buying a card just to get the free $2.00. Check it out here. I really do have the best parents in the world. I don't know if they realize how awesome they are. They are always there for me when I need them and they support me in everything I do. Although my Dad did laugh at me when I told him that I am going to run a marathon. The worst part is that he tried to hide the laugh. It was so funny. He was probably picturing me running the bases (huffing and puffing) when I played softball as a teenager. Running never was one of my Strong points but boy could I hit the ball. :) I can't say I blame him for laughing. I have been laughing inside for the past few days. That's what make it that much better. The unexpected person proving that she can run a 1/2 marathon. Awesome!!! My parents really would do anything for me. It is a great feeling to be loved that much. It's funny how you don't realize what a good thing it is until you are an adult. I love them so much! And on to that Awesome Giveaway. 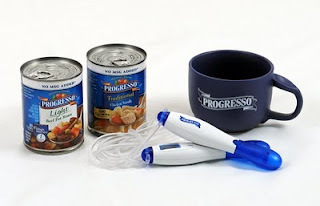 Progresso sent me tons of free soup this week along with a digital jump rope (awesome!) that count calories and jumps and the biggest (and nicest) soup mug I have ever seen. It has a little divot in the handle for your thumb when you carry it. This is really one of the nicest packages and giveaway's I have ever received. It really is awesome! One of my lucky readers will receive the Progesso price package above. I am so excited about this one. I'm so happy that one of you can enjoy the Progresso soup, jump rope and mug. I am going to have so much fun trying all of their soups. They sent me 15 very large cans and they are all different. Which means I get to taste test 15 cans of healthy soup. It's pretty exiting! I didn't realize that they had that much of a variety. It is awesome that I will be able to taste them all (without feeling guilty) and be able to figure out which ones are my favorites so I can buy them in the future. I will keep you updated on my favorites in the next few weeks. Thanks Progresso! 1. leave a comment for your chance to win. 3. For a third entry put my button on your blog. Copy the html code under my button and add an html code to your blog. Be sure to come back and leave a comment with your link. Winner will be chosen using a random number generator. All entries must be received by Tuesday, January 12, 2010 at 11:59 CST. The winner will be announced Wednesday, January 13, 2010. Celebrate the New Year and a new you with Progresso Light and 100 Calorie Soups. From January 4 through March 15th you can visit http://www.progressosoup.com/souperyou/ to enter the Progresso "Souper You Debut" contest for the chance to win a full makeover in New York City.Three grand prize winners will be awarded a trip for two to New York City from May 21st-23rd. The prize includes round-trip airfare, a two-night stay in a NYC hotel, a full makeover, a $1,000 wardrobe shopping spree and personal consultation at a New York department store. This sounds so cool. I can't wait to enter the contest. I would love a trip to New York City. I hope you all enjoy the Progesso Giveaway and Contest! Good luck to all of my readers! I would love to win the soup prize package. Love your blog! I have been lurking for a while now, hoping to be inspired myself. I love hearing a "real" person's story about weight loss without adding in fad diets. I'm so excited to hear about your marathon progress! You can do it!! Thanks for the opportunity to win the soup package! I would love to have that jump rope! You CAN do it - a 3 miler today and a marathon. :) When you finish it - you'll be laughing then! Free healthy soup sounds good to me...oh and the jump rope looks really cool too. I have missed reading your blog over the holidays...but just got to catch up! I'm thinking more and more about doing the weight loss challenge at the gym...just so that I have that extra accontability to do it...over the past 2 years i've gained 25 pounds and become more and more miserable...best of luck with the the 1/2 marathon....i've NEVER been a runner and the other week i ran for about 5 mintues and was so impressed with myself....you can do it! I love to eat Progresso soup for breakfast. It is filling and hot. The Chicken and Dumpling for 2 points (for the whole can) is great. If I win I'll refrain from drinking hot chocolate from the cool soup bowl. I have been reading your blog for awhile now and I find it very encouraging..thanks for all of the good information..and it has inspired me to get my self in gear and lose this unwanted weight.. I am participating in Walk for Wishes..
ok, for my third entry, I put your button on my blog. that jump rope looks awesome! I am so inspired by your goal to run a marathon! I am so out of shape I get winded running to the mailbox. I am changing that now, but it might take a while! I think that is so cool that you get to try all of those soups! I am a soup and salad kind of girl, so that is right up my alley! I haven't been by in a while but congrats on your progress!! I'm so impressed. I lost my job in October and came back to your site to find some more budget meal inspiration! That's a great soup giveaway btw! I read your blog everyday. You inspire me to better myself. YOU CAN RUN 3 miles! And you can run a half marathon. I am proof that anyone can run a 5K, 10K, half marathons, and then full marathons!!! Plus, running is a great cardio workout! Oh goodness - I would sooo love to win!! Progressive is super duper yummy! What a great give-away. That mug looks super. Don't let him get you down! It's a good day for soup at our house, it's s-o-o-o cold. Jess, It's great to see you getting right back into being healthly after the holidays. You motivate me into getting back into it, Thanks! I love Progresso soup. I'd love to win. I wanna win to help me get ready to run with you!!! I really enjoy reading about losing weight on a budget...thanks! I am in! Now I will just have to get the dvd! Oh PLEASE let me win!!! What a great give-away!! I would love to win the prize; The thirty day challenge sounds like fun! I just love your blog! Great giveaway!